Arizona Geology: Mapping Earth Fissures in Arizona - An ongoing task! Mapping Earth Fissures in Arizona - An ongoing task! Over the past several years, the AZGS’ Earth Fissure Mapping team has identified new and reactivated earth fissures in Cochise, La Paz, Maricopa, and Pinal Counties. In early January 2017, we identified a fresh, nearly 2-mile-long, up to 10-feet wide, and approximately 30-feet deep earth fissure in the Tator Hills area of southern Pinal County. For the first time, we used drone imagery to complement fissure mapping. The resulting drone videos received more than 725,000 views at our AZGS Youtube channel (video links: Tator Hills video 1; and video 2). Media response to release of the drone videos was swift, with Phoenix- and Tucson-based television, print, and radio outlets taking the lead (see listing below). Over the past two weeks, the story has appeared in more than 2 dozen media outlets, including the Arizona Daily Star and Forbes Magazine. AZGS staff have escorted representatives from seven media outlets on tours of the earth fissure. For additional information, please feel free to contacts us or review our most recent report, Discovery of a large earth fissure in the southern Picacho Basin, Pinal County, Arizona. Earth Fissure Background. 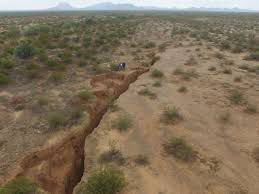 Earth fissures are large ground cracks that accompany land subsidence, which is in turn driven by groundwater pumping and collapsing ground water levels. Sheet flow that accompanies Arizona’s monsoon rains erodes, enlarges, and lengthens fissures. Earth fissures pose a threat to people, livestock, and property values, as well as public infrastructure: roads, utilities, pipelines, canals, and buildings. From 2007 to mid-2016, per A.R.S. 32-2117, the Arizona Geological Survey used part of its state appropriations to identify and map nearly 200 miles of fissures in 26 study areas in Cochise, La Paz, Maricopa, Pima, and Pinal Counties. The maps and related reports are available online at the AZGS Document Repository and at the interactive Natural Hazards in Arizona Viewer on our website. Since moving to the University of Arizona in July 2016, we continue to map and monitor fissures in order to provide pertinent information to the public and government agencies as we discover new or reactivated fissures. Select Media Outlets that released earth fissures stories (linked here) over the past two weeks.